Vacation rental cabin / bungalow. Sleeps 12, 5 bedrooms, 2 bathrooms. Dogs allowed. Welcome! Take time to Paws and Reflect here in this incredible cabin in the forest! 5/30: Enter into the Rec Room Cozy and Entertaining. 9/30: Stay toasty in the cooler seasons by the fireplace. 10/30: Enjoy a meal with your family & friends. 13/30: Exit through the sliding glass doors onto the expansive porch. 17/30: Pick a movie from the library, between bedrooms 1 & 2. 21/30: A pano view of Bedroom 3. Paws and Reflect is the perfect title for taking that much needed break from your busy life and enjoying the beautiful Sierra Nevada mountains that are so close by. 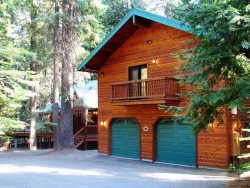 This incredible home is located on over 1/2 an acre of land in the Stanislaus National Forest...just a short walk away from a trailhead into the Arnold Rim Trail system. The Arnold Rim Trail is a non-motorized trail system designed for hikers, mountain bikers and equestrians and the perfect backdrop to your mountain vacation! The main living space of this home is very open... the well stocked Kitchen is open to both the Dining area and the Living room. The Dining table has an extra leaf and extra chairs for your Guests. There is additional eating space at the Breakfast Bar that connect the Dining area with the Kitchen. The Lopi Wood Stove in the Living Room will keep you nice and warm as you relax on the extra comfy sectional sofa with recliners. Want to dine outside? This home has the perfect wrap around deck with outdoor furniture and BBQ grill. Not only are you surrounded by the forest but the forest comes up to greet you with a gorgeous oak tree growing right in the center of the deck! With 5 bedrooms everyone will enjoy their own privacy. In fact, two of the bedrooms even have their own, private balconies where Guests can have their morning coffee while listening to the birds sing. For entertainment the Paws and Reflect cabin has all the electronic amenities you need... high-speed wireless internet, a large screen, HDMI Smart TV in the living room and an extra TV in the Rec Room. Speaking of the downstairs Recreation Room... get the whole gang together for some fun around the Pool Table! There's plenty to do here including games, books, puzzles and the ever present outdoors! Please note for WINTER reservations, Paws & Reflect has an up-slope driveway. Four Wheel Drive vehicles and snow chains for your tires are highly recommended. Flight of stairs required to access living areas. As the name indicates, this home is Pet Friendly and welcomes your four-legged family members. Ask your Reservationist as a non-refundable $100 pet fee will apply. Imagine taking your dog for a walk on the Arnold Rim Trail... an experience you'll both enjoy and will never forget! There is so much to discover nearby... Arnold Rim Trail, White Pines Lake, the Stanislaus River, Big Trees Fitness Center and Public Pool...World renowned Big Trees State Park...home of some of the largest and most beautiful Sequoia Trees are all less than 5 minutes away! Award winning wineries and boutique style shopping opportunities in the nearby town of Murphys will be sure to please everyone. And of course Bear Valley Ski Resort and numerous high country lakes and trails (Including the Pacific Crest Trail) are all just a short drive away! We look forward to having you as our Guest at the "Paws and Reflect" cabin! We know this will become one of your favorite places to visit! Special notes about this home Pet Friendly (additional fee), No Central AC only fresh mtn air and portable cooling units, Read your emailed Guest Packet. Upslope driveway. Stairs required to access living areas.